Long have law enforcement agencies relied on canines to assist them in their efforts of stopping criminals regarding a number of different offenses. 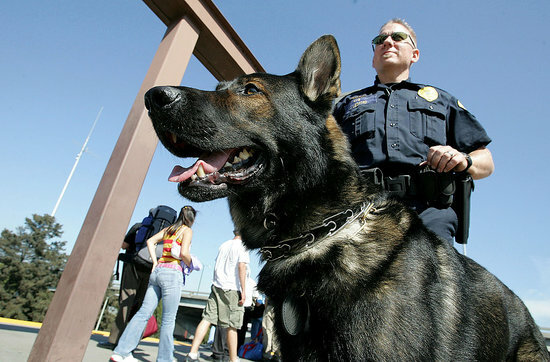 Dogs are extensively trained using a number of different techniques to detect drugs, bombs, and cadavers. Although there are many who would argue that dogs are far from reliable and the use of them may even be unconstitutional. On Tuesday, the U.S. Supreme Court ruled that police must first obtain a search warrant before bringing drug-sniffing police dogs onto a suspect’s property to look for evidence, the Associated Press reports. In a 5 to 4 vote, the court ruled to uphold a Florida Supreme Court ruling that dismissed evidence seized based on a scent by a chocolate Lab named Franky. The dog’s ability to detect marijuana growing inside a home in Miami by sniffing outside the house was unconstitutional according to the court. Throughout Franky’s career as a police dog with the Miami-Dade Police Department, he was responsible for the seizure of more than 2.5 tons of marijuana and $4.9 million in drug-contaminated money. After seven years of assisting the force, Franky was retired. The U.S. Supreme court ruled police are not required to extensively document a drug-sniffing dog’s reliability to justify relying on the canine to search a vehicle. The US Supreme Court's ruling was responsible for overturning a Florida Supreme Court decision involving a German shepherd named Aldo. The canine detected drugs in a vehicle, officers then conducted a search and found 200 pseudoephedrine pills and 8,000 matches - both key ingredients for methamphetamine production. The Florida Supreme Court ruled police needed to compile detailed evidence of the dog’s reliability before probable cause was established to search the vehicle.